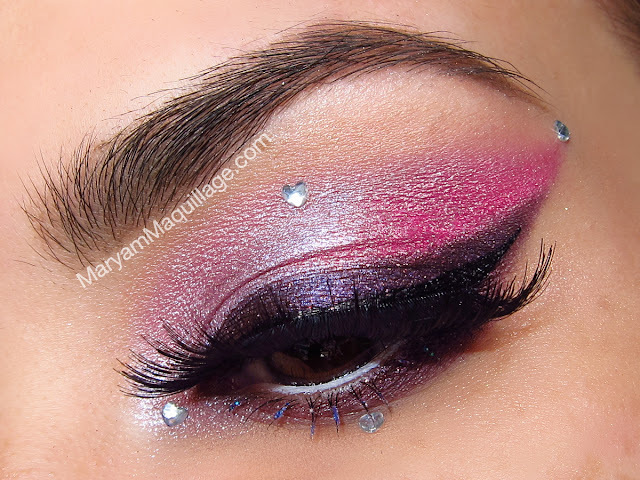 Maryam Maquillage: 50 Shades of Pink! Salut mes amis! Can you count all the hearts in the above collage? If so, then you know that this look is once again inspired by Valentine's Day. Pink is my favorite color (along with yellow) and today I'm celebrating all the shades of PINK -- there are far more than just 50!! I've created a fun, avant-garde look focusing on glittery sugar-heart lips, shimmery cat eyes and one fabulously PINK vintage lady hat that dates back all the way to the 1940's!! Can you just imagine the fashionista who owned it -- she must've been a Diva in her day! The least dramatic aspect of my look, this shimmery eye makeup was done using solely MAC pigments. I'm not a huge fan of MAC eye shadows, but I do love the pigments -- they are fun to use and the results are über saturated. Prep your lips with a lip balm. I like Zen Society 100% Vegan Balm. Line your lips with a pink lip liner and outline the negative space of the heart. Fill in the negative space. Apply a bright pink lipstick over the lip liner. Blot, reapply, and blot again. Fill in the heart shape with a lavender lipstick. Do not blot. Dip your finger into chunky glitter and adhere directly to the heart shape. Clean your finger and dip it again to apply more. It's important to clean your finger between applications, otherwise the glitter will get muddy. This gorgeous nail dress from Katie Cazorla (The Painted Nail) Valentine's Day Collection for Kiss is one of my favorite designs of all the nail dresses. The green and gold peacock feathers over bright fuchsia together make such a fun and wearable color combo, plus the brightness makes the toesies look tan! I love the fact that Katie's collection isn't a literal interpretation of Valentine's hearts and pink glitter, so it's perfect for any occasion (though this design is very V-Day appropriate). Topped with Kiss Gel Top Coat & cured in Kiss PRO LED lamp for extra shine and longevity. Kiss Nail Dress are said to last up to 10 days without gel. Although the adhesion of Kiss Nail Dress is much stronger than most stickers I've tried, I prefer to add a layer of gel to cure the edges and add shine. Otherwise, the edges start peeling back much sooner and the surface tends to dull out. Availability: Kiss Limited Edition Valentine's Day Nail Dress Collection by Katie Cazorla is available at Walgreens, Walmart and Kmart stores nationwide, retailing for about $7 per set. The complete gel line is currently available at Walgreens, CVS, Rite Aid, Walmart & Kmart stores nationwide. The retail price for the starter system with LED lamp is $49.99. You look incredible! I LOVE your toes so much! Fabulous all around! Ohh my Good!! I love the toes, i will so do that! And what you did with your lips is absolutely stunning woman! You have such a beautiful profile - your photography is always so stunning! love love love the lips and love love love the toes...muy bueno. Oh my god, I really love your make ups. Actually I don't like pink that much, but you look so gorgeous. Oh Gosh, I love everything! Maryam! OMG! I love this! The lippie is amazing! OMG! OMG! I am speechless! I LOVE this post. <3 You are just amazing!! So insanely pretty and flawless makeup as always! Loving all these different shades of pink Im a girly girl so you know this is one of my favorite colors! the lips look like fish scales you should do silver with purple and blue then add that it would be sooo cool!!! oh girl! such an amazing look! i'm in love with this! You look fabulous! I'm head over heels over your pedicure! Awww I don't know how you do but I am never able to take a gracious picture of my toe nail polish ahah! soooooo cute, pink is my color! you're always pretty!!! its so nice to see you again!!! Love the pink lipstick! Now I have to add more things to my Lime Crime list!! Wow... Fabulous. I love the lips and nails on your toe ;o)... Xoxo V.V. They look so nice especially the shimmery eye makeup was gorgeous. Stunning!! The colours are beautiful and I love your lips!! The lips have to be super fantastic... Love them! I love all the lovely colours together on your toenails! My favourite part of this look by far is the lips! That glitter looks fabulous and it is just perfectly applied. This is mind blowing!!! Totally adore this... Came here thru BPS Facebook page! CouponerStore.com makes you available with exclusive cosmetics promotional offers and cosmetics coupon codes that will let you get much discounts while your online shoppings. Wide range of Mobile Phones from multiple suppliers; choose best supplier with best prices and excellent services. All Mobile Phones suppliers are verified by AdClout which ensures best quality products.